You are now reading "U.S. Senate Committee on Finance: Dr...."
On Tuesday, January 29, 2019, Dr. Peter Bach, alongside Kathy Sego, Dr. Douglas Holtz-Eakin, and Dr. Mark Miller, testified before U.S. Senate Finance Committee at its first hearing of the session, Drug Pricing in America: A Prescription for Change, Part I. The hearing, led by Senator Chuck Grassley (R-IA), chairman of the Finance Committee, took place in accordance with released statement naming health care costs as “top priority“. 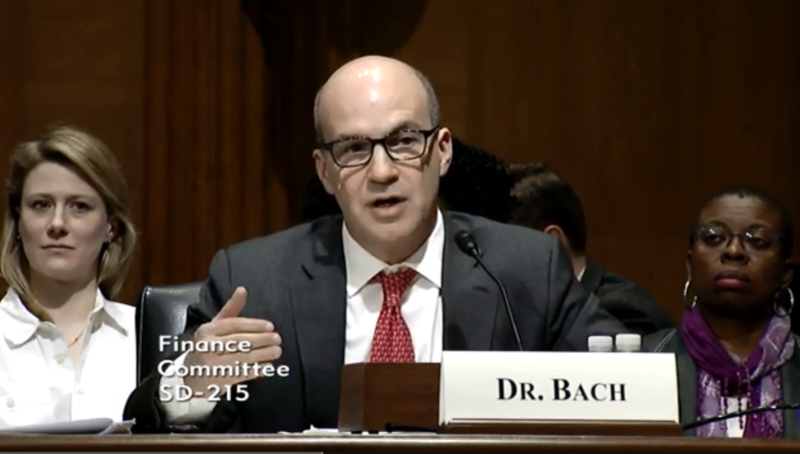 During his testimony, Dr. Bach presented an overview of the pharmaceutical supply chain and evidence-based policy options, many of which are supported by Drug Pricing Lab research. These policy options include a subscription model for HCV treatment, reforms to Medicare Part B and Part D, such as modifying the ASP+6% reimbursement to a flat fee, improved competition for high priced therapies like CAR-T therapies by way of various entities’ authority over coverage decisions and alternative payment testing, value-based pricing, and implementation of an international pricing index. Read full written testimony here.